Delene Baigent – Owner, Manager & Beauty/Spa Therapist. I have been working here at Woman as a Senior Therapist since Jan 2014 and took over as the new owner in May 2015. It’s my job to make sure that the business runs smoothly, but more importantly that our clients experience the high levels of professionalism we’re known for. Everyone that comes in to Woman should enjoy their treatments and leave happy! All that said, I’m still very much a ‘hands on’ therapist. I enjoy all aspects of the wide range of advanced treatments and products we have to offer, but I especially enjoy nail treatments and waxing. When I’m not working you’ll find me out walking with my spoodle, Roxy, or with my nose in a good book. I love socialising over a drink and try to get away every now and then on a good break with my man! 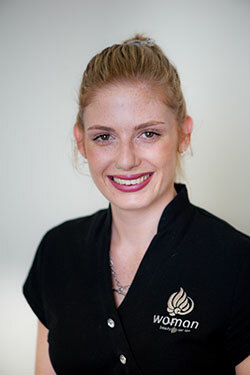 Bridgette Morgan – Assistant Manager & Beauty/Spa Therapist. I have been a part of the Woman team since July 2014, since then with Delene’s guidance I have been able to gain the experience and skills of a Senior Therapist and I am thrilled to be Delene’s Second in Charge. I keep myself busy by offering all of the treatments we carry out at Woman, however I specialise in facials and skincare prescriptions. Woman is such a wonderful place to work. The whole team is genuinely passionate about their role in uplifting our clients, helping them to feel good about themselves and take much needed breaks from their everyday lives. When I’m not working you will almost always find me keeping active, whether it is in the gym or outdoors, my endorphins keep me going! I also love spending time with my family, or ducking away with my partner and friends. Holly KIngi-Miki (Poirier) – Beauty/Spa Therapist. I have been part of the Woman Team since 2013. I feel fortunate to be able to offer my clients so much variety with our fabulous Woman treatments, from waxing and facials to spa treatments. I also offer Foot Reflexology. I enjoy all aspects of the industry, and being able to contribute to a client’s relaxation and positive wellbeing. It is a real privilege to be able to provide our clients with the highest quality of care in all their experiences. Whanau is everything to me, so outside of work you will undoubtedly find me spending time with my family and friends. 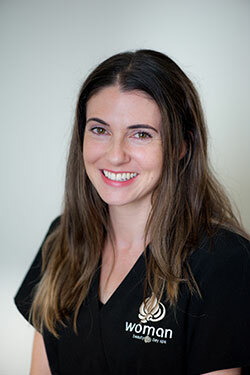 Hayley Muollo – Beauty/Spa Therapist. I have been with the Woman team since November 2016 and I feel very lucky to be a part of such a supportive group of colleagues. I specialise in massage, facials and body treatments and I enjoy offering a holistic approach to beauty therapy, incorporating the mind, body and soul. My goal is always to ensure my clients leave feeling rested, relaxed and stress-free. When I’m not working you’ll generally find me outside! I love spending time among nature, that might include biking, tramping, kayaking or enjoying time in the Marlborough Sounds with my friends, family and dog! 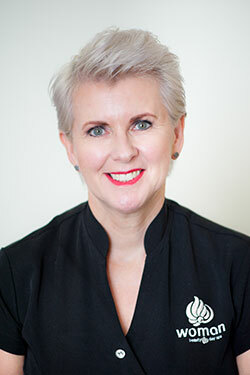 Pip Mcmullan – Receptionist/Spa Co-ordinator. I joined the team at Woman mid 2017, and really enjoy being part of the team. I’m generally one of the first people that clients meet when they walk through the doors, so ‘welcoming’ is my middle name! I like to think of myself as chief of happiness! It’s my job to ensure that their troubles begin to melt away as soon as they step into the relaxing atmosphere of the spa. Out of work I like to keep fit, through walking, biking and pole fitness. I also love spending time with my friends. 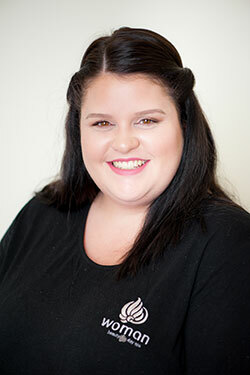 Stacey Inwood – Receptionist & Beauty/Spa Therapist. I get the best of both worlds at Woman. Because I work on reception I get to meet lots of our wonderful clients when they step through the door, but I also get to help them feel even more pampered and relaxed in the treatment rooms. We have a lovely relaxing space and get to use the most beautiful products, it makes the job a joy really. When I’m not at work I enjoy getting out into nature with my children and exploring nearby spots, like golden bay. I also love spending time with friends, keeping fit and occasionally drinking wine! 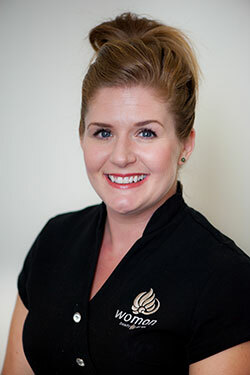 Lauren McLean – Beauty/Spa Therapist. I joined the team at Woman late in 2018, the best thing about being part of the team is that every day is different and there is always something new to learn. 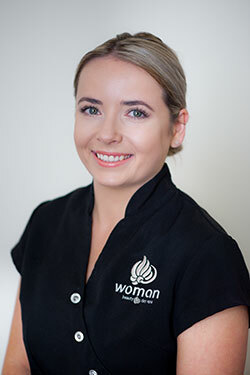 If I had to describe what we do here at Woman in three words, I’d use the words ‘relaxing, perfection and caring.’ I specialise in all things relaxing like massage, manicure, pedicures and spa facials. But I also enjoy makeup.Outside of work, I enjoy spending quality time with the people I care about, whether it’s going for a walk, getting coffee, or simply staying in. 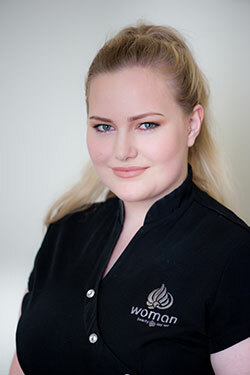 Anja Dunlop – Beauty/Spa Therapist. I joined the Woman Beauty team at the beginning of 2019. I love working with my clients to achieve their skin goals, these are attained through a combination of the fabulous range of products we carry and wonderful facial treatments. As well as specialising in facial treatments, I also carry out waxing and electrolysis, massage and nail treatments. I love that we create a truly relaxing atmosphere where our clients can feel as wonderful as they look. It’s good to work among a team of highly skilled, experienced therapists where we can turn to each other for guidance and advice, if needed. It’s an added bonus that we work in such a beautiful environment.